Lying midway between Eastern Cape Port Elizabeth and East London, Kenton-on-Sea is one of the most beautiful places in the Eastern Cape. Amongst beaches blessed with the most magnificent natural assets, Kenton-on-Sea's Kariega Beach has been voted the best beach in the Eastern Cape and South Africa. Referred to as 'the jewel of the Sunshine Coast', Kenton-on-Sea nestles between the mouths of the aloe-lined Eastern Cape Boesmans River and Kariega River. Both are tidal waterways offering great fishing and bird-watching opportunities, with frequent sightings of the Eastern Cape Fish Eagle and Little Sunbird. The magnificent Eastern Cape sand dunes, fantastic rock pools and rock formations of the unspoilt Kenton-on-Sea beaches never cease to delight both adult and child alike. To complete the Kenton-on-Sea magic, Southern Right Whales and Humpback Whales also make this Eastern Cape coastline home, when they return to Kenton-on-Sea each year between July and December. 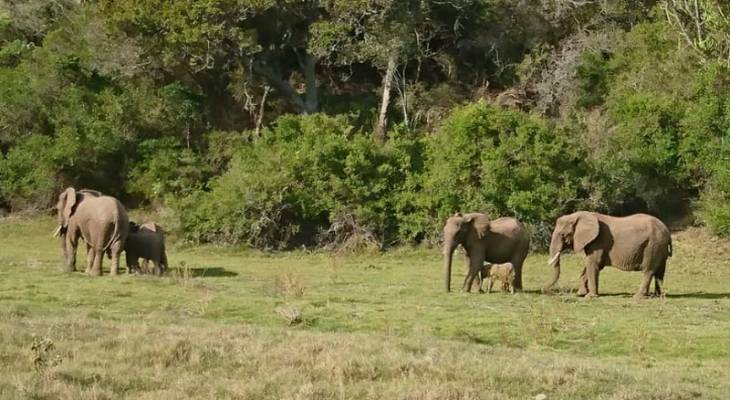 Kenton-on-Sea is only a few kilometres from a number of Eastern Cape Game Reserves that offer malaria-free game viewing, including the Big Five. Kenton-on-Sea Private Game Reserve accommodation at Sibuya Game Reserve is discretely tucked into a small forest on the Kariega river bank, where you will feel a sense of oneness with the wilderness all around. With no schedules and absolutely no pressure on guests to do anything other than relax, Eastern Cape Sibuya Game Reserve combines the finest in Kenton-on-Sea Game Reserve safari luxury, with fabulous service and truly memorable Eastern Cape Game Reserve experiences. For the more actively Eastern Cape adventurous, Kenton-on-Sea offers hiking trails and mountain biking, and for those seeking culture, the neighbouring Eastern Cape town of Grahamstown (59km from Kenton-on-Sea accommodation), hosts the annual Grahamstown National Arts Festival, a 10 day celebration of dance, theatre, comedy, music, art exhibitions, workshops and Eastern Cape tours. Known as 'the place where the sun spends the winter’, Kenton-on-Sea, or just 'Kenton' as the locals call it, is the ideal Eastern Cape holiday destination for the whole family. With its pristine Eastern Cape beaches perfect for swimming, surfing, sun tanning, snorkelling, fishing and lazy sun-tanning, and the quiet Kenton-on-Sea Nature Reserve with its network of interesting trails, Kenton-on-Sea is one of the Eastern Cape's most popular holiday resorts. - from Port Elizabeth, drive North on the N2 for 40km, turn off on the R72. From there Kenton-on-Sea is about 70km. - from East London, drive 156km or 1hr 44 minutes along the R72 to Kenton-on-Sea. The balmy Kenton-on-Sea temperate climate almost guarantees summer temperatures no higher than 27°C, with most rainfall during summer, and winter temperatures usually never fall below 10°C. With the warm Mozambique current flowing past this part of the Eastern Cape coastline, the water is delightful all year round. As one of the most picturesque holiday resorts in the Eastern Cape, Kenton-on-Sea accommodation is superlative. Kenton-on-Sea Self Catering Cottage accommodation boasts magnificent views of the Eastern Cape coastline, Bushmans River and Kariega River; luxury Kenton-on-Sea Bed & Breakfast accommodation from which you can whale watch; Kenton-on-Sea Private Game Reserve accommodation on a malaria-free 'Big-5' Eastern Cape Game Reserve e.g Sibuya Game Reserve , and Kenton-on-Sea Self Catering Apartment accommodation situated just five minutes from the Kenton-on-Sea village centre, restaurants, Kariega River, Kenton-on-Sea lagoon and Kenton-on-Sea main beach. Visit the WhereToStay Kenton-on-Sea accommodation page for more details on these outstanding Kenton-on-Sea establishments. Other Eastern Cape towns near Kenton-on-Sea with WhereToStay accommodation listings : Bushman's River Mouth accommodation 4.2km; Cannon Rocks accommodation 16.3km; Port Alfred accommodation 25.3km; Alexandria accommodation 26.9km; Seafield/ Kleinemonde accommodation 42.9km; Grahamstown accommodation 59.2km. For some good 'down home' fun, go line dancing in the Kenton Hall on Monday nights. Nature lovers will enjoy hiking in the Joan Muirhead Nature Reserve, where trails will take you on an easy hike through the 30h reserve above Kariega Beach between the Bushman’s and Kariega Rivers. Whether you're a beginner or an advanced rider, the mountain bike enthusiast must try the Sebumo Tude Mountain Bike Trails, where you can do 6.5 km and 9 km tracks through beautiful indigenous bush. Between July and December every year visitors flock to Kenton-on-Sea to watch whales breach off the Eastern Cape shore. - Bushman's Bar & Grill offers top class meals - finger licking baskets, hearty burgers, tasty ribs, matured steaks, succulent seafood and more! - Sandbar Floating Restaurant situated on a permanently moored boat is a rustic, homely and comfortable Eastern Cape eatery with a menu characterized by pub fare and South African favourites. Kenton-on-sea overview. Kenton-on-sea Accommodation and Information.